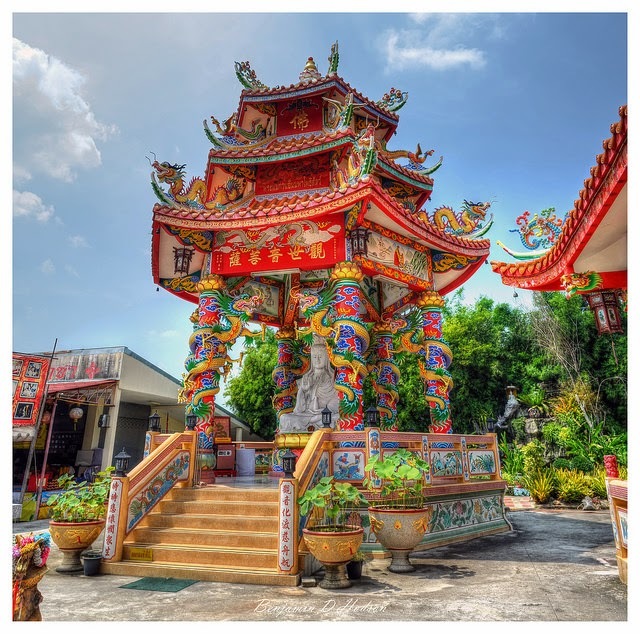 Nikhom Phatthana Chinese Temple is located at the heart of the township of Nikhom Phatthana in the District of Nikhom Phatthana, Rayong Province, Thailand. The temple architecture is common to this style of Thai-Chinese temple; those that note this particular branch of Thai-Chinese Buddhism. Dedicated to Guan Yin the Goddess of Compassion, Mercy and Kindness (Thai: Kuan Eim กวนอิม or Prah Mae Kuan Eim). Guan Yim in her current form (female) a reflection of the Lotus Sutra, with the power to transform in appearance to relieve suffering. Nikhom Phatthana temple is also home to a range of other deities such as the Laughing Buddha (Bodai), the God of Wealth and Fortune, the ubiquitous dragon creature Pi Yao (Pixiu;"to ward off evil spirits"), and depictions of Guan Yu (Guan Gong) the God of Protection, etc. Don't forget to bang on the drum and ring the bell! Questions? If you have any further questions about Nikhom Phatthana Chinese Temple, tours to Nikhom Phatthana from Pattay City or would like to purchase some of the artwork contained in this article, please feel free to contact me using the details provided.